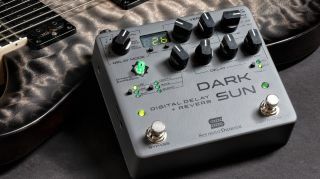 Based on Holcomb's favorite sounds from the company's Andromeda and Silver Lake pedals, the Dark Sun merges warm digital delay with a hall reverb. Seymour Duncan has teamed up with Periphery’s Mark Holcomb to create the new Dark Sun delay and reverb pedal. Users can shape the effects’ EQ, add saturation and chorus or use the company's Dynamic Expression to control the mix with their playing dynamics. The pedal also features a tap tempo footswitch with four adjustable tap divisions, while tempo can also be set via MIDI and displayed in milliseconds or beats per minute. The pedal's Routing Control switch features four ways to route the effects. Each effect can be routed to left or right outputs, allowing for use in stereo or as two separate pedals. “I'm so excited to finally release the Dark Sun!,” Holcomb said. “We've designed this pedal to be the ultimate delay and reverb combo but, over the course of its development, it has served as something much more for me: an idea generator, a writing companion—something you can plug into and rely on for inspiration. The Seymour Duncan Mark Holcomb Dark Sun Delay/Reverb pedal is available now for $369. For more info, head on over to seymourduncan.com.